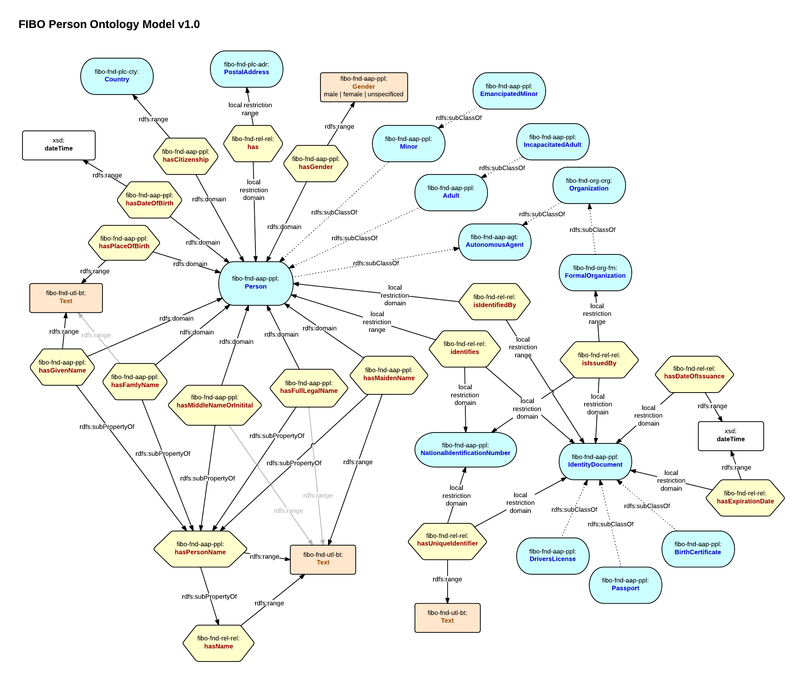 In most cases when working with or designing an ontology I like to be able to visualise the model. When designing an ontology from scratch I typically draw out the model on a whiteboard or directly into a drawing tool, for example LucidChart (my current favourite) or OmniGraffle. This approach lets us rapidly iterate the model visually before getting our hands dirty with OWL and RDF. It also allows us to collaborate on the model in a much more effective way, and engage domain experts whom might not be familiar with RDF. 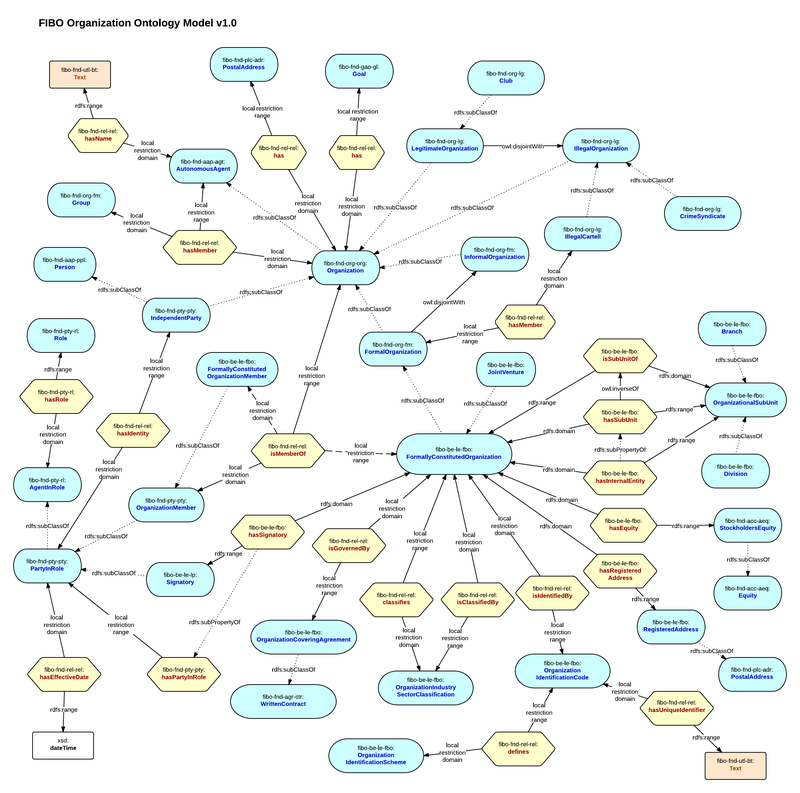 The FIBO v1.0 ontologies currently consist of a set of foundation models and a set of models describing the characteristics of business entities. Future FIBO ontologies (yet to be published by EDM) will model the domain of financial instruments and indexes. Many of the foundation predicates from the FIBO Relations ontology are specified without formal RDFS domains and ranges in order to enable re-use. Their usages within each more specific domain ontology are then defined using local OWL Restrictions on classes. On the diagrams I have indicated these as virtual domains and ranges of the predicates, clearly distinct from the explicit rdfs:domain and rdfs:range predicate definitions that can be reasoned upon. I hope these visualisations are helpful. Both images can be seen in full resolution if opened in a new browser tab, or downloaded. In a future post I hope to tackle visualisations for Functional Business Entities, Contracts, Accounting Equity and the Legal domains once these models are released.